← Modi Comes Out of Silent Mode? 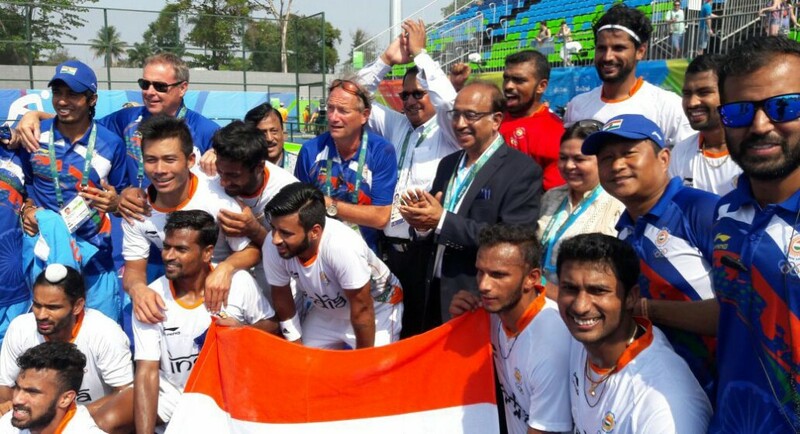 The sports and youth affairs minister, Vijay Goel, rightly drew criticism for his boorish behavior at the Rio Olympics by invading restricted sporting arenas, as pointed to him by an Olympic official in a letter, with his battery of bureaucratic flunkies. Goel, as was to be expected, feigned ignorance about his team flouting any rule and blamed it all on ‘misunderstanding’ because of the ‘language problem’. He could not have been more unconvincing. Goel should have known, or should have been warned in advance by his officials, that even though he is a minister in India he cannot roam freely with a retinue at the Olympic Games venue when the competition is on. The ‘language problem’ would have us believe that Goel expects everyone around him to speak or understand Hindi, his mother tongue. Goel, we are sure, can claim some ability to converse in English which is, of course, not spoken as widely in Brazil as in India but there will always be enough English-speaking men and women around the Games venue to help foreigners. In defence of Goel it has been said that the letter handed over to him did not accuse him personally of bad behavior—it was the battery of his officials who behaved crudely at the Olympic venue. The officials may be used to that kind of behavior in their country but the fact cannot be denied that a lot Indians, if not the majority, make a fool of themselves while travelling abroad. To digress a little. Some years ago when there was a sudden spurt in ‘racial’ attacks on Indians in Australia it emerged that a lot of trouble arose because of ‘loud’ speaking Indians whose behavior was viewed as loutish. Many Indians do tend to forget when they travel abroad their boisterousness can be irritating to those who are not used to it. The reprimand that Goel, the minister, invited should not surprise any Indian. We are used to witnessing our very authority-conscious VIPs behave atrociously in public places. They are rarely seen without being ‘protected’ by a posse of security personnel –in plain clothes or in uniform with weapons. They love being the centre of attention wherever they go. Display of deference towards them is de rigueur. To that list—by no means complete in itself—add one more that is in tune with the contemporary world: taking selfies with people who do enjoy some popularity and recognition in the country—such as sports persons and film stars. Questions have been raised about the appropriateness of Goel’s presence at Rio. He undoubtedly would justify it by saying that as the country’s sports minister it was his ‘duty’ to fly to the Olympic Games venue to cheer the Indian team. In fact, this argument was also at the back of the mind of the Haryana sports minister who also flew to Rio with officials. But his objective was rather parochial. He was not flying out with a team of his officials to cheer the entire Indian contingent of about 100 but about 20 of them who belong to his state. The state exchequer was poorer by at least one crore for financing the Haryana minister’s trip to Rio but what is that amount when the cause is boosting the morale of a section of the Indian athletes! The Haryana minister’s knowledge or even interest in the various sporting events in which players from his state are participating at Rio may be nil or limited. But he knows that as a minister flying to exotic places is one his perks and he cannot sacrifice it. Nor can Goel who, elected to the Rajya Sabha from Rajasthan, was appointed sports minister only a few weeks before the Rio Olympics began. It means that he had almost nothing to do with the selection of the Indian contingent or its training. But that is pointless quibbling because the minister during whose tenure the Indian team was picked up and trained has been sent to his home state as the chief minister and had presumably such important matters to attend to that he could not even think of advancing his claim to a free ticket to Rio. India’s poor performance in the international sporting arena in most events barring perhaps cricket is seen as a matter of national shame. It has reached a stage when foreigners too have been deriding the Indian performance. The Chinese media does it regularly, attributing India’s poor record to a variety of weird reasons that include ‘religious practices’ and ‘vegetarianism’. The negative Chinese comments, however, betray their antipathy towards India, a nation that they do not want to see challenge them in any sphere. They themselves need to be condemned for adopting most cruel methods to train their youngsters for international competition. In their desire to excel, the Chinese subject youngsters, some barely five or six, to a rigorous regimen that their delicate bodies cannot take. At the end of the day we have to stop being satisfied with a handful or nil medals from international competitions because it is simply not possible that a nation of 1.2 billion people has acute dearth of world class sporting performers. A common view in India is that sports administration in India is among the worst in the world because it is a plaything of our politicians—mostly old. These geriatric politicians also like to hold on to their position in sport administration for life—and frequently fly out to ‘cheer’ the Indian team and, yes, take selfies with them.